Metal products used in conjunction with doors. For example locks hinges and handles. Also referred to as Door Furniture. This page is a brief introduction to the range of objects and their functions that come under the general classification of Door Furniture. Door Hardware : An old band and gudgeon hinge that is interesting because in it used with a second hinge in a pair of doors. Depending on whether to bolts on the inside of the door are fixed or open the whole door can be opened or just one leaf, the active leaf. Door Hardware : A modern mortise lock with a separate lock cylinder, lever handle. It has an electric strike and an electronic swipe card reader fixed to the door jamb above. 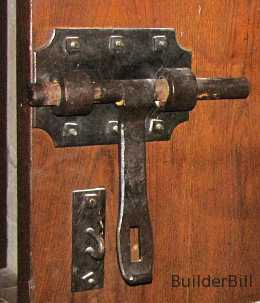 Door Hardware : An old pad-bolt in the open position. 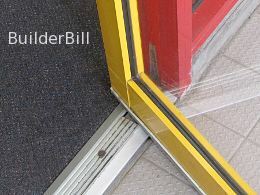 Door Hardware : An aluminium threshold weather seal to an external aluminium and glass pivot door. Given that we have a door and an opening to put it in then we have to have some method of opening and closing it. This function is taken care of either by hinges or some sliding mechanism. Hinges allow the door to swing, most of the time from one edge of the door, as in the photo on the left, but in the case of pivot hinges they may be set slightly inside the edge. Hinges can be face fixed (as in the photo here) edge fixed or a combination of both. These allow a door to slide sideways. They can range from the door just resting in a groove or rolling on runners. The runners can be mounted n the top or the bottom of the door. Given that the door is now swinging or sliding then we need something to open and close it with. We need something to hold it in position during normal use and we need something to secure it. The photo at the right shows a combination of handle, lock and latch. An aid to opening and closing a door manually. Examples are:- quite simple fixed "D" handles on cupboard doors, larger fixed Pull Handles to external entry doors, handles that incorporate lock cylinders, knobs or lever handles that rotate to operate a lock or latch. 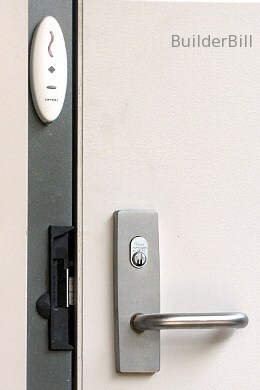 A hardware device to keep a door closed but not necessarily locked. They can be face fixed (as in the photo) or they can be mortised into the door. A door hardware device to keep a door secure from entry by unauthorised persons. Can be operated by keys or electronically. Once again they can be fixed to the door face, morticed into the door for greater security or they can be a separate item such as a Padlock that is used in conjunction with other hardware items. Stike plate assemblies that release the door locks at an electronic signal. As from a swipe card. Another method of securing a door is by means of bolts. They range from very small to quite large ironmongery items. Normally bolts are fixed to the inside face of a door, top and bottom. They can only be opened from one side. Hardware devices used to fix doors into a locked position. They consist of a movable bar in a frame that is fixed to a door. The bar has an open position when it is retraced and a closed position when extended in a hole or mortise in the door jamb or threshold. They can be divided into Flush bolts which are set flush with the face of the door. Strap Bolts which often are described as Panic Bolts. These bolts are used on the outside of a door. They have a Hasp and Staple type of extension that permits the bolt to be secured by a padlock when they are closed. 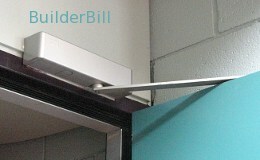 A mechanical method of closing a door. Alsocalled a Door Check. As with most door furniture categories there are many different types of door closers. They nearly all use some variation of a spring mechanism. The one shown here is a common one that has it's internal spring attached to a piston set inside an oil cylinder. This gives a smooth, two stage operation. 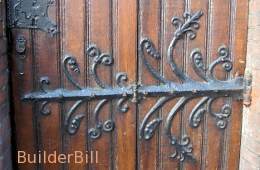 Hardware devices or materials that seal the edges of doors. In different profiles and materials they can be used to seal drafts, smoke and fire, rainwater, sound and light. Here is a list of other door furniture items that can be used in certain circumstances. The ones that are formatted as links lead to more detailed pages.